all grilled to melty perfection. 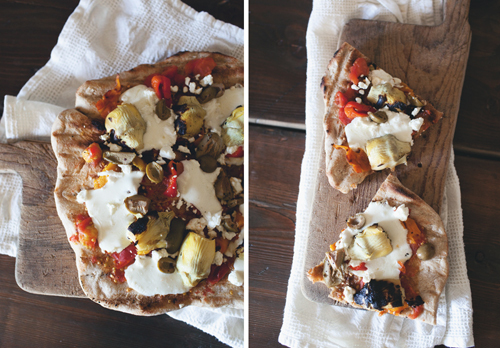 Mmm, nothing says summer to me like grilled pizza! Deeee-lish! I just might have to do that this weekend! so excited to try this recipe!! i making pizzas as many different and creative ways as i can! so i'm thrilled! new to the little red house. what a fantastic header and blog! we grilled a pizza the other night and it was delicious; though i'm used to grilling on a gas grill, this was our first time on a charcoal. which did you use? I love the rustic look of this pizza! Great photos plus it sounds amazing!